The Aero Precision VG6 EPSILON 556 is the pinnacle of AR15 muzzle devices. 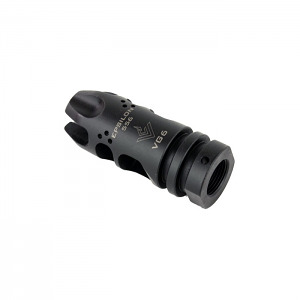 Utilizing many of the same muzzle brake/compensating features as the GAMMA 556, the EPSILON 556 also includes additional flash hiding characteristics. Extended flash hiding prongs and no ports at the 12 o’clock positions allow uninhibited view from flash through optics or sights. The difference in porting is also noticed on the underside of the device where it has 6 valve holes to allow the fastest gasses reaching the second chamber to exit. This creates very soft low energy recoil that allows for absolute control.